• Grade: UNS NO. C 10100, 10200, 10300, 10800, 12000, 12200, 70600 (CU -NI- 90/10), 71500(CU -NI- 70/30). IR / sr 90 deg/45 deg elbows, long bend, tees, reducers, cross, 180 deg return bend, expansion bend, caps. 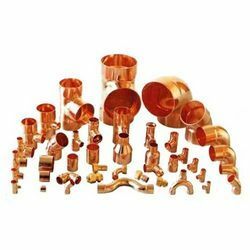 We offer copper alloy buttweld fitting with the following types and specifications Types: lr / sr 90 deg/45 deg elbows, long bend, tees, reducers, cross, 180 deg return bend, expansion bend, caps. Grade: astm / asme sb 111 uns no. C 10100, c 10200, c 10300, c 10800, c 12000, c 12200, c 70600, c 71500. astm / asme sb 466 uns no. TYPES : LR / SR 90 DEG/45 DEG ELBOWS, LONG BEND, TEES, REDUCERS, CROSS, 180 DEG RETURN BEND, EXPANSION BEND, CAPS. GRADES : ASTM / ASME SB 111 UNS NO.C 10100, C 10200, C 10300, C 10800, C 12000, C 12200, C 70600, C 71500. 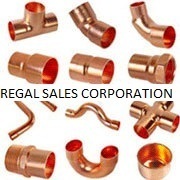 Types: LR / SR 90 deg / 45 deg elbows, long bend, tees, reducers, cross, 180 deg return bend, expansion bend and caps. Grade: UNS NO. C 10100,10200,10300,10800,12000,12200,70600 (CU -NI- 90/10),71500(CU -NI- 70/30).